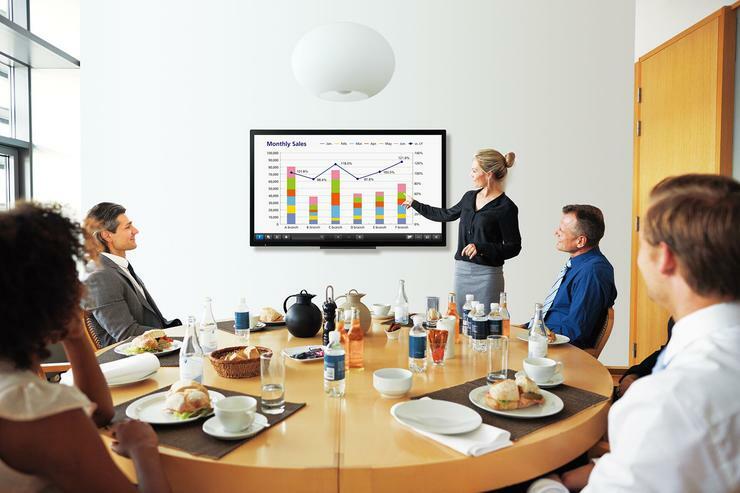 Sharp has added the PN-50TC1 to their existing range of Huddle Boards. The TC1 aims to enhance meetings for two to six people and transform communication for a smoother and more productive workplace, according to Sharp. The TC1 range comes in a 50-inch or 40-inch screen and features a full-flat design with 10-point multi-touch functionality. The Huddle Board comes with a 2mm tip touch pen to make onscreen annotations. An onscreen menu allows easy switch inputs, options for touch and pen modes, and access to other frequently used functions. Scanned documents can be directly imported to Sharp pen software from a compatible Sharp Multi-function printer. Built in wireless broadband allows up to 10 devices including both Mac and Windows computers, various smartphones and tablets to be connected simultaneously. The PN-50TC1/40TC1 includes an extension slot compatible with the Intel Mini Open Pluggable Specification (Mini OPS) and a range of interface terminals such as HDMI and Display Port 1.2. The latest Huddle Boards can be installed in a landscape, portrait or horizontal orientation, and features anti-glare glass which resists fingerprints and reduces reflections, according to Sharp. The PN-50TC1 also features a mount for a web camera, and a bundled stand for desktop or landscape set up. For more information, visit https://www.sharp.net.au/business-products/information-display-panels/pn50tc1.